Chief Constable Meredydd Hughes... You're Nicked !! I just heard the news that smug faced, arrogant , holier than though Meredydd Hughes has been banned for driving at 90 m.p.h. on the A.5 in North Wales. Laugh...I laughed so much the tears ran down my legs !! This disingenuous little man obviously was not as passionate about safety as he made out he was. He couldn't even heed his own advice. This episode brings into question the validity of the information spouted by the pro speed camera brigade, of which Meredydd Hughes was a leading exponent. For those of us who know that speed cameras are only revenue creating machines this is justice indeed, if only to see that sickly, smug smile wiped right off his face. What goes around comes around.... the best laugh I have had for years. Last Sunday morning I was watching BBC1 tele as you do because Andrew Marr's slot is always informative and entertaining. I look forward to Carol Thatcher reviewing the papers cause she is an absolute scream, blunt and to the point. Bit like her mother really. After Andrew Marr at 10.00 is a discussion programme centred round religion "The Big Question" chaired by Nicky Campbell and last week there was an audience of well respected people with strong religious views debating moral and religious issues. Among those present were the ever waffling Lord Carey ex Archbishop of Canterbury, Ann Widdecombe MP with her splendid 60's style "flick Ups" hair do, Libby Purves, Professor Richard Dawkins and John Barrowman. 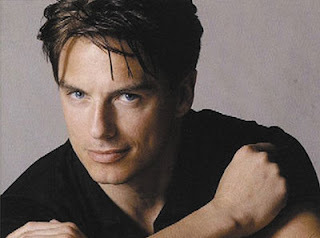 John Barrowman impressed me greatly for his honest and candid response to him being gay. He said, in so many words, that he does not accept under any circumstances that because he is gay he is an evil and wicked person because he is not. He said he was a good person and did good things for people through his carreer and in his private life. He looked at the audience of so called dignatories and bigots and said, "you may at your services have parents who have gay and lesbian children, imagine how they feel when you tell them that their children are evil and despicable. Nicky Campbell also questioned John on his latest album titled "John Barrowman Another Side" and was asked how he chose the songs. One of those songs is the Cyndie Lauper Classic "Time After Time" and John told a little story about a friend in America who had plucked up courage to tell his parents that he was Gay, which is never easy as your heart tells you rightly or wrongly that rejection is a distinct possibility. Not only this but at the same time he also had to tell them he was HIV positive. He told them and was not rejected, but a couple days later a parcel was delivered to his home with a letter from his dad which basically said, I was never very good at putting into words how I feel but the enclosed CD of Cyndi Lauper's song "Time After Time" says it all, so play it. The words in the song ....if you're lost you can look--and you will find me time after time if you fall I will catch you--I'll be waiting time after time . John said, this was the measure of unrequited love of a parent for their child. The foregoing is not verbatim but is certainly the gist. I hope every bigoted, pious, holier than though backside on those seats in the audience was uncomfortably squirming. Good on you John ! Go and buy Johns latest album, it's full of very nice songs sung by a very nice person. People, be aware of this lot if your looking for last minute tickets for a concert. A colleague of mine has just gone through a most harrowing experience and it's not over yet ! 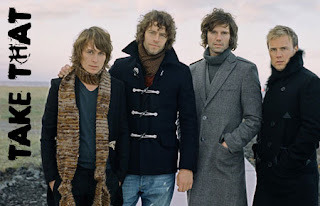 You see, she is a great, and I mean great with a capital G, Take That fan, along with her three friends who as a group of girls have been to a concert on every Take That tour there has ever been. As everyone knows, this latest tour was sold out so quickly you didn't have time to draw breath before the shutters were down! In desperation, the girls hunted the web and came across the glitzy web site http://www.no1soldoutevents.com/ and applied for tickets last February and handed over their credit card payment to the tune of £760.12. Yes, you have got it ...almost £200 per ticket. I think you get the picture now that these girls are well and truly fans and have counted the days to the November concert for the past nine months. No tickets arrived and in desperation my colleague phoned and e-mailed them and didn't get a reply. 2 days before the concert No1soldoutevents contacted my colleague and said tickets were not available and they would credit her VISA card. Yes, you read correctly, this mob have sat on the girls money earning interest for nine months and flippantly say sorry there are no tickets. Were there ever any tickets you may ask yourself? Even after saying there were no tickets they were still advertising them for sale on their web site...oh yeah !! To add insult to injury they said four days after the bombshell that they could no longer credit the credit card and needed my colleagues bank account details to credit her account. Well, would you do that ? Now it's a cheque in the post and at the time of writing this has still not been received. Does this smack of a breathtaking scam... what do you think ? Imagine how much money can be extorted from vulnerable people, leave it in a bank account earning interest and then say, goods not available here's you money back and we will just pocket the interest..thanks and goodbye you mugs. Trading standards need to look at this methinks. Oh, the website has dramatically changed in the past week and it has been jazzed up and contains testimonials from satisfied clients now saying how wonderful their service is. Oh what a surprise but then anyone can write those can't they. To leave you on a high note, after all the crying and gnashing of teeth, out of desperation my colleague the day before the concert telephoned the NEC and she was offered restricted viewing tickets and you cannot imagine the screams and crying of delight from the girls, I heard some of it on the speaker phone. It was brilliant. They went and even with restricted viewing they had such a wonderful night, saw more than enough of the Take That guys, heard every song perfectly and drank in the incredible atmosphere and all for the price of....£28.00 each. Yes, you heard correctly £28.00. There is a lesson for all of us in this and that is, no matter how desperate you are there is always someway out. Have a look at this No1soldoutevents website, remember it well and whatever you do steer clear of them if you want to keep your money and avoid disappointment. 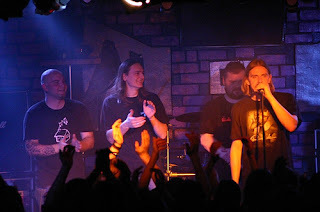 Last night I went to Camden Underworld in London to see Polish band Riverside play their first U.K. London gig. As I have said before their recordings are quite brilliant and innovative. Predictably the small venue was packed with Polish fans or the inquisitive (not too sure) but there were quite a few British as well !! As an aside, I have to say that some of the punters appeared to need a good wash and to learn where the deodorant shelf is at Boots ! OMG the whiff from some pushing their way through the crowd took your breath away ! Anyway, the gig. It was mediocre, the sound was less than good and the venue did nothing to facilitate shorter persons, in other words if you were 6 foot or more tall you pushed your way to the front and obscured everyone else's vision. It always makes me laugh that tall people don't have the gumption or manners to realise that short at the front, tall at the back means everyone gets a look in. Oh well. We drove 300 miles to get a glimpse of this band who have massive potential, were bitterly disappointed and left halfway through to go and have a drink in Old Compton Street, Soho where there was a lot of colourful people and there was a true buzz about the place, which was more than can be said about Camden Underworld. Just a word for the band...choose a better venue for London next time... The Mean Fiddler for instance or even a Carling Academy somewhere...they are made to give the punter an enjoyable listening experience.